The BPL WILL be open Saturday, April 20th. The Bridgeport Public Library Board of Directors is accepting applications for a volunteer board position. Deadline extended. 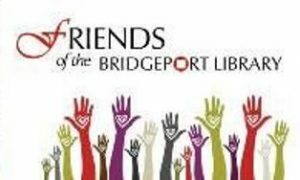 Any registered voter in the city of Bridgeport who has a high level of familiarity with the city’s libraries and who holds a library card may apply. Individuals who have a strong interest and wish to help reposition the Bridgeport Public Library facilities, collections, programs, and staff to help focus on building community, helping people, and changing lives are attributes sought. Applicants must be able to attend two or more monthly meetings. The New East Side Branch of the BPL is now open. Do you have old home movies on VHS that you would like to convert to DVD? 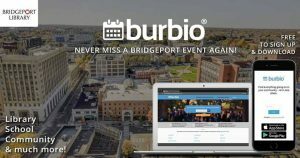 FIND ALL YOUR BRIDGEPORT EVENTS IN ONE PLACE!! Borrow eBooks, audiobooks, and more – anywhere, anytime through Overdrive and RBdigital. All you need is a library card. RBdigital, the world’s largest newstand. Instantly browse the latest issues of your favorite magazines. Freegal, free downloadable music from Sony. Use your library card to download up to five songs a week and stream up to 3 hours of music a day! Mango Languages prepares learners for realistic conversations and strengthens everyday communication skills in over 70 world languages, including English. Just print out an application. Fill it out and bring it to the library with proper ID’s (ID info is on each application.) and at no cost become a member of the BPL.